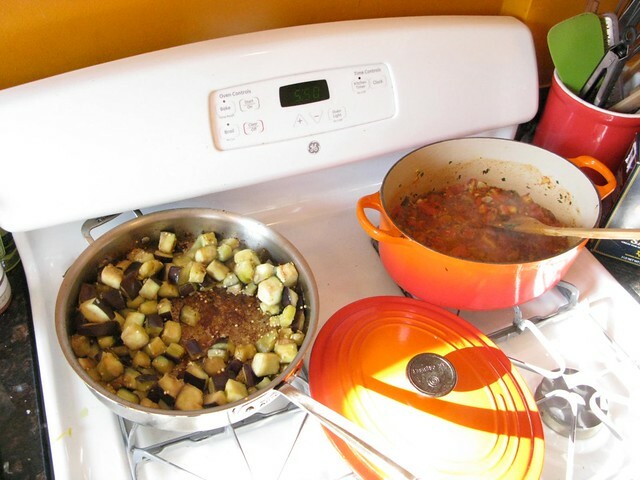 It’s been more than a month since I made the ratatouille you see in the above photo. 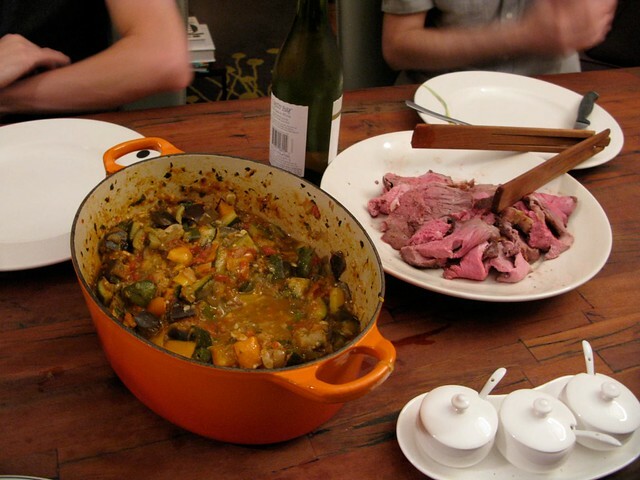 I made it for a dinner party where there was lamb (a leg of lamb, actually) and, as many will tell you, ratatouille goes well with lamb. 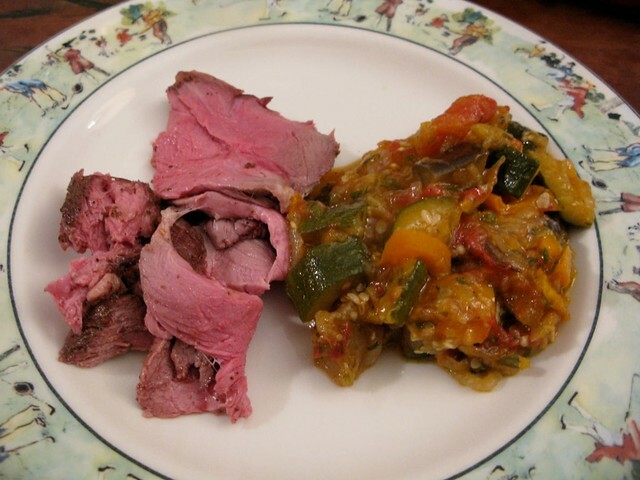 When I wrote my last book, the final chapter “Feast” featured a leg of lamb paired with a ratatouille just like you see above. In fact, it was the exact same recipe as the one you see above, a recipe from Gourmet magazine that now lives on Epicurious. It’s a recipe that takes a lot of work. You blanch tomatoes and then peel the skin off, you chop them and cook them into a sauce with garlic and basil, you salt eggplant and let it strain (to get the bitterness out), you cook onions by themselves, then peppers by themselves, then zucchini by itself then eggplant by itself all of which, at the end, you add to the pot with the tomatoes and simmer for an hour. (Are you out of breath yet?) By the end, you’d think you’d have a flavor powerhouse: all those vegetables! All that time! But that’s not really the case. No, this ratatouille is a subtle affair. It’s a quiet thrill, one that’s a gentle celebration of summer. The kind of celebration where you drink Kool-Aid in paper cups, not the kind where people are swinging from chandeliers. So as long as those are your expectations going in, you won’t be disappointed. Don’t let me yuck your yum. 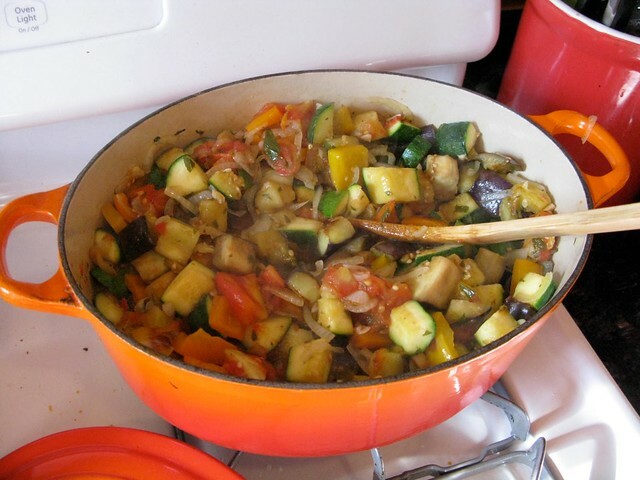 If you think this ratatouille looks good, make it! Add more garlic and more salt. We’ll discuss. Here’s the recipe. 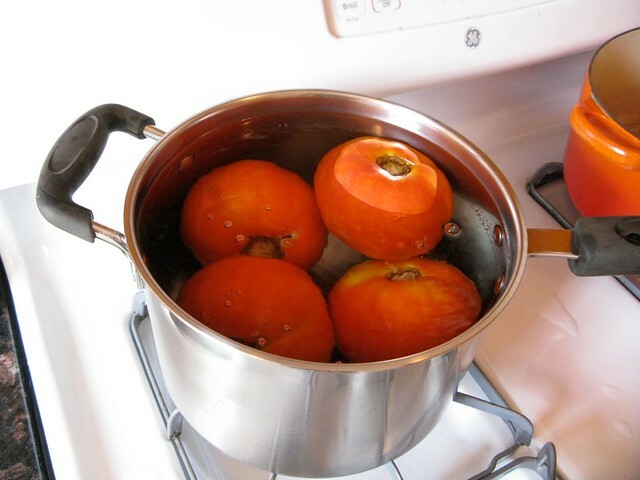 and blanch together in a 4-quart pot of boiling water 1 minute. 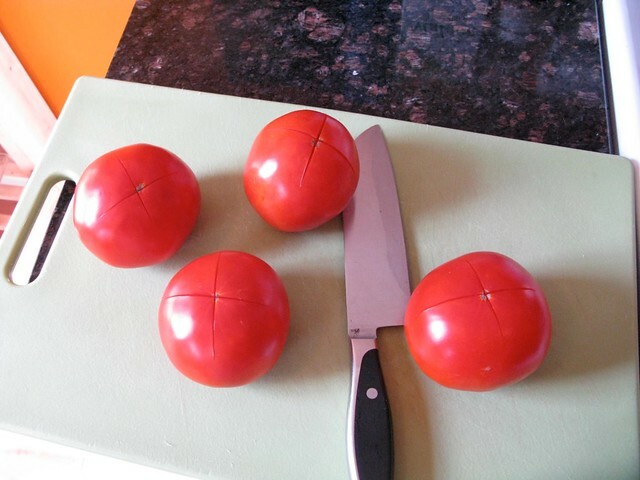 Transfer tomatoes with a slotted spoon to a cutting board and, when cool enough to handle, peel off skin, beginning from scored end, with paring knife. 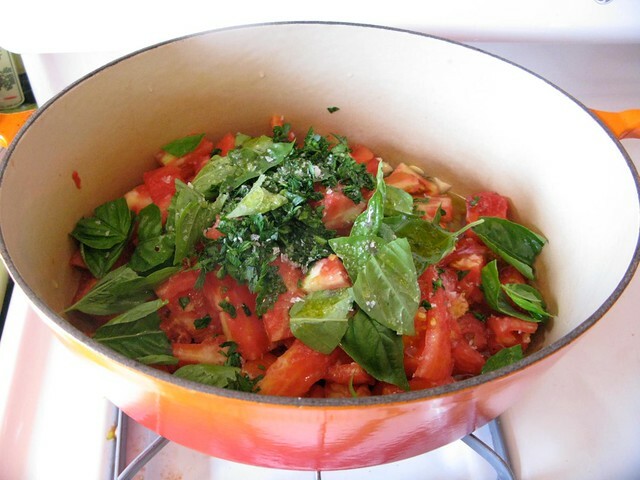 Coarsely chop tomatoes and transfer to a 5-quart heavy pot with garlic, parsley, basil, and 1/3 cup oil. Simmer, partially covered, stirring occasionally, until tomatoes break down and sauce is slightly thickened, about 30 minutes. 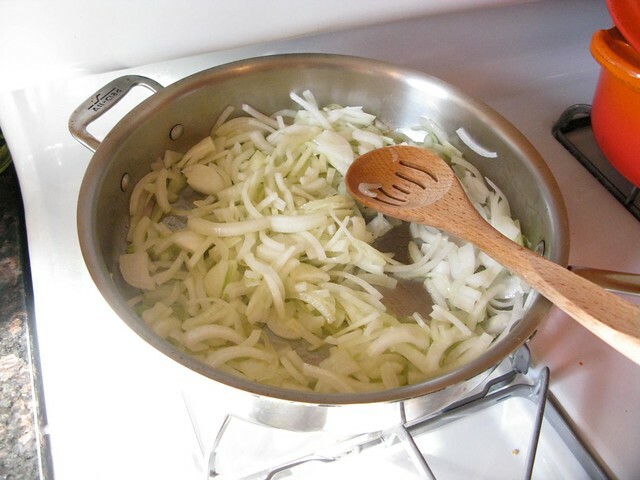 Meanwhile, cook onions in 3 tablespoons oil with 1/4 teaspoon salt in a 12-inch heavy skillet over moderate heat, stirring occasionally, until softened, 10 to 12 minutes. 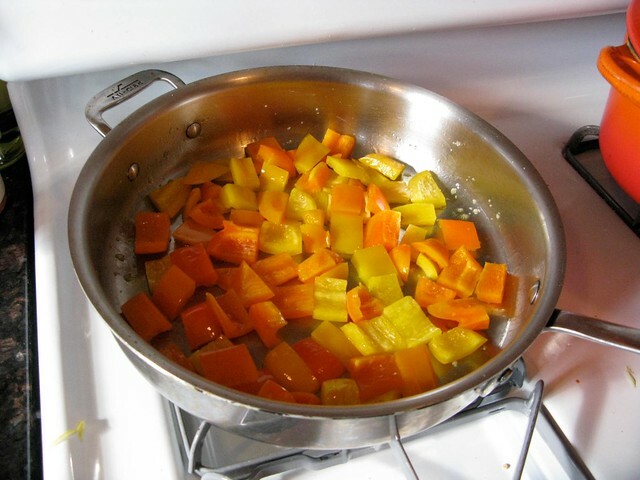 Transfer onions with a slotted spoon to a large bowl, then add 3 tablespoons oil to skillet and cook bell peppers with 1/4 teaspoon salt over moderate heat, stirring occasionally, until softened, about 10 minutes. 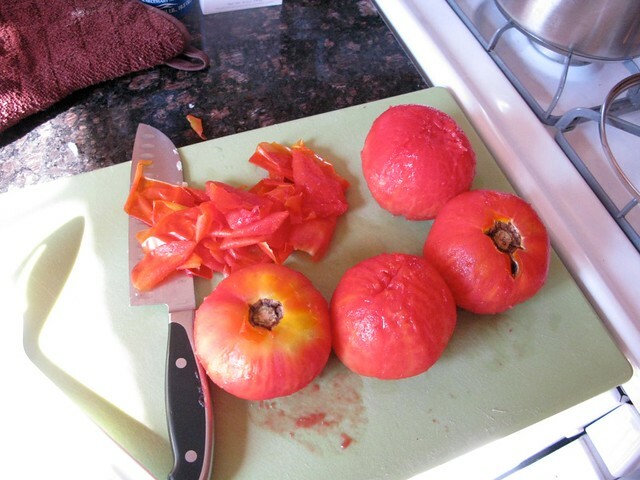 Transfer peppers with slotted spoon to bowl with onions. 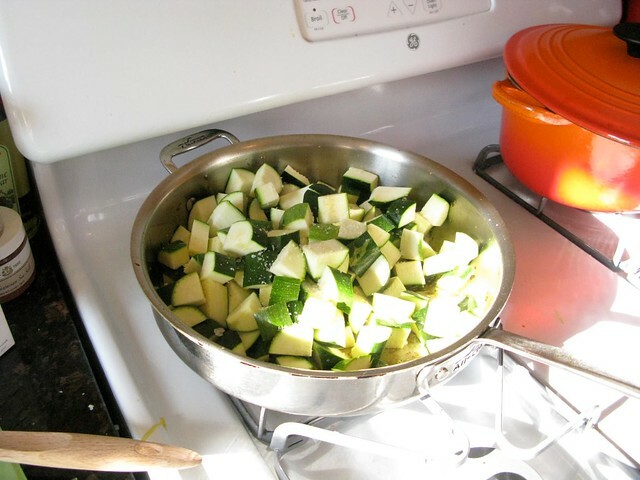 Add 3 tablespoons oil to skillet and cook zucchini with 1/4 teaspoon salt over moderate heat, stirring occasionally, until just tender, 6 to 8 minutes. 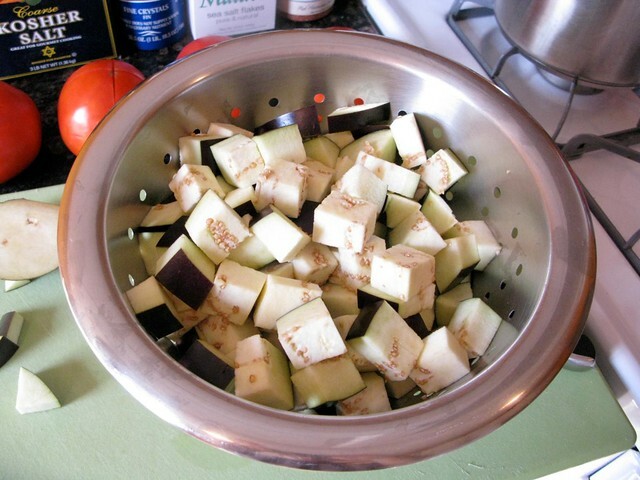 Transfer zucchini with slotted spoon to bowl with other vegetables. and simmer, covered, stirring occasionally, until vegetables are very tender, about 1 hour.